Please click on Programs, above, for information on the program for our next meeting. We meet in a woodworking shop where they make bee hives. There are several chairs available but not enough for everyone so if you are able, please bring a folding chair of some kind for the meeting. 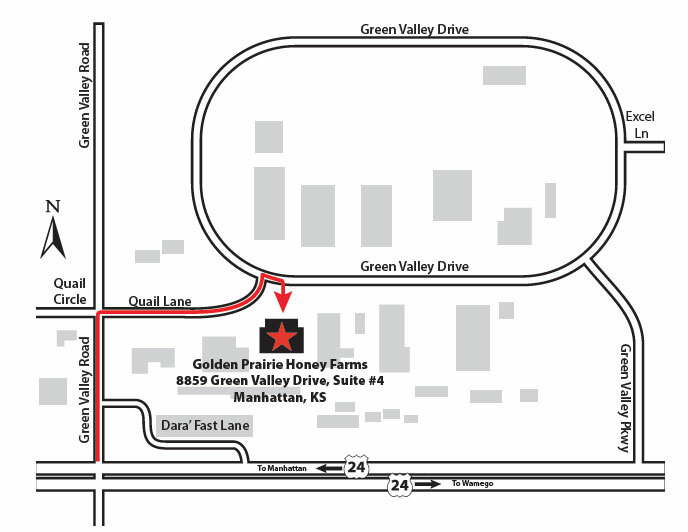 See the map below for the meeting site. We meet at 8859 Green Valley Drive, Suite #4, Manhattan, KS, on the first Saturday of each month from 9:00 am to about noon. Come any time after 8. Enter at the rear of the building. Members are encouraged to come early to take advantage of discussions with fellow woodturners regarding the craft as well as to stick around for awhile after the meeting to help clean up and put equipment away. We will usually have fresh coffee and donuts available. Special events held instead of or in addition to a monthly meeting are well advertised at regular meetings, in the newsletter, by special e-mail messages to the membership, and in advance on the web site under Coming Up, found under Regular Monthly Meeting. Special meetings may include picnics, potlucks, and public woodturning demonstrations. Members are encouraged to bring items to show and discuss in which other members may have an interest. Normally this is a woodturning, however it could be a tool, a jig, or anything else pertaining to woodturning. Turnings do not have to be a member’s best work or a finished piece. Even projects which didn’t work are good to bring as we can all learn from them. If in doubt, bring it – share it. Following Show and Tell, we have a short business meeting where we have officer reports, announcements, and other information of interest to the membership. 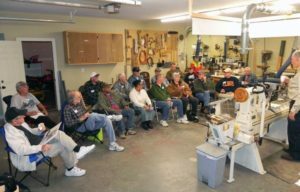 Each monthly program covers some aspect of woodturning such as wood selection, lathes, chucks, tools, sharpening, safety, and many different woodturning techniques. The May 2019 demo will be by nationally known woodturner and demonstrator Alan Lacer, demonstrating and teaching use of the skew and turning a box. Click on Programs above for more info on his demo and other following events. FHW sponsors a silent auction of donated wood, tools, and other items at each club meeting. Members are encouraged to donate items. Proceeds go into the general fund. FHW has a book and DVD library for use by its members. There is no fee involved in borrowing library materials but please bring your check-outs back the following month. Our mentoring program puts members requesting assistance in furthering their woodturning skills with an experienced member who can provide that assistance. Once or twice a month, we have Skill Enhancement at Red Oak Hollow Lathe Works. That is held during the week in the evening from 7pm to 9:30pm. We will have instructors available to help enhance those skills. This is usually an “open shop” format but occasionally we will have a focused, or specific, skill on which we will work. Annual membership dues are $35, which includes everyone living in one household. For more information, contact Ray Case, the club president, at president@flinthillswoodturners.org. 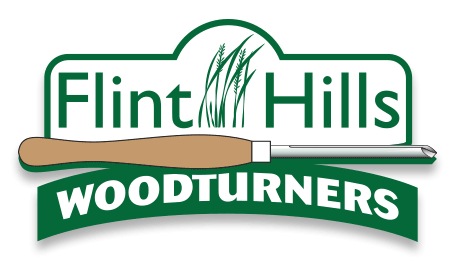 The Flint Hills Woodturners encourages, but does not require, members to join the American Association of Woodturners (AAW). Members are encouraged to attend the annual AAW national symposium and to participate as volunteers to assist demonstrators whenever possible.